We have a full roster and more than a few alternates this week. There is still room for more alternates though, so please sign up online if you would like to add your name to the list. Here is the roster for the game on Thursday, January 29, 2015. We take the ice at 9:30 PM and play for 60 minutes. Your slot may be forfeit if you arrive at the rink after 9:15. This entry was posted in Roster and tagged 2015, January, Main Street Arena, Roster on January 27, 2015 by Sperry Hockey. David Delamere is handling the roster this week. Seamus Moody has filled the second goalie spot, and we otherwise have a full roster. There is still room for alternates though, so sign up online if you would like to add your name to the list. Here is the roster for the game on Thursday, January 22, 2015. We take the ice at 9:30 PM and play for 60 minutes. Your slot may be forfeit if you arrive at the rink after 9:15. This entry was posted in Roster and tagged 2015, January, Main Street Arena, Roster on January 21, 2015 by Sperry Hockey. Here is the roster for Thursday January 15 2015. We have a full roster of skaters, but we still need a second goalies. Please signup online if you can play! This entry was posted in Roster and tagged 2015, January, Main Street Arena, Roster on January 15, 2015 by Sperry Hockey. Happy new year! Looks like we have enough to play shift on the fly tonight, so no auto-horn for tonight’s Sperry hockey game. We have 11 per side, so one extra player should rotate through the line changes. We’ll play shift on the fly like last week. Don’t forget the earlier start at 9:00 PM. 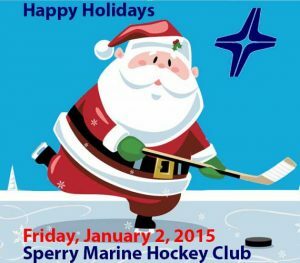 This entry was posted in Roster and tagged 2015, January, Main Street Arena, Roster on January 2, 2015 by Sperry Hockey.